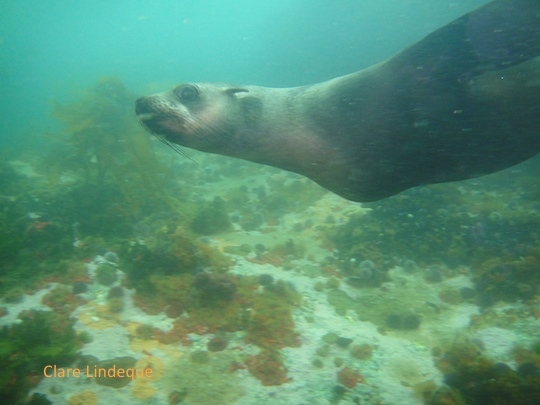 We did a boat dive to Justin’s Caves off Oudekraal early in December, and we were harrassed – or menaced – by a large Cape fur seal, who followed us for at least half the dive. He swam between us and came very close, and while he didn’t show his teeth or try to bite anyone, he was sufficiently forceful in his approaches to make most of us quite twitchy. 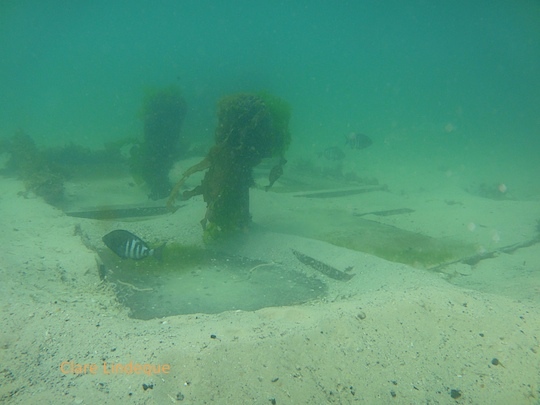 The visibility wasn’t amazing, which contributed to the slight feeling of unease. This prose poem makes my head spin, and makes me think about consequences. The sleepy shark rolls from bed at the sound of the bell: the fisherman’s foot ringing in the water. On the pier a young girl purchases a dried apricot from a vendor and rolls its wrinkled skin over her tongue before biting down. Behind tightly drawn curtains, the boy who might have grown up to be her great love (or grocer) succumbs to his illness and orphans his parents, as the shark draws behind a curtain of foam. The girl, grown tired of waiting for her father, disappears into the crowded streets of the village as a bell ringing from the marketplace wakes the sleeping fisherman just in time to reel in his apricot. 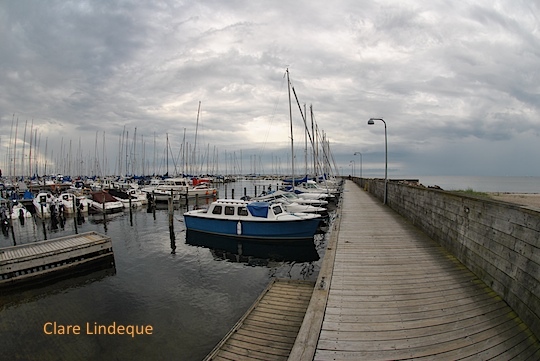 The young boy watching from the pier bites his tongue at the sight of the wrinkled skin. Succumbing to his illness, he runs off to the grocer as if to his lover. The young girl, running late for dinner, stops off at the marketplace on her way home. She purchases a shark from the vendor and leads it home through the crowded streets of the village to meet her parents. The girl is an orphan but it doesn’t matter. There are wedding bells ringing in her ears. They’re in love. 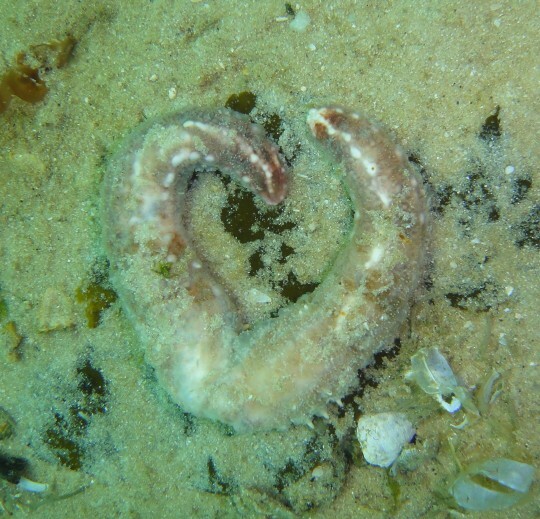 Tony has already posted a video of the courting behaviour of the enigmatic fish called steentjies. 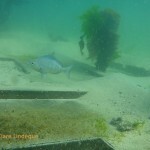 Here are some stills taken at Long Beach of their breeding area. You can see the areas where the male steentjies have cleared away the sand using their tails as little brooms. Their behaviour is quite obsessive – they constantly brush away any little bit of sand that washes over their chosen breeding area. The males then defend the cleared areas vigorously, turning black (as you can see in the top picture) from the head backwards, and developing stronger zebra-like stripes on their flanks. 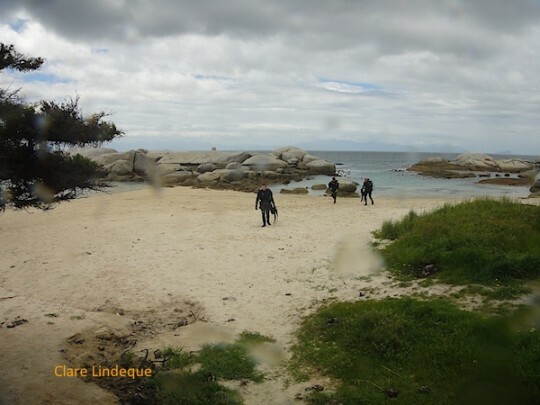 They chase away other steentjie males, klipfish, and divers. The energy cost of all this must be enormous. 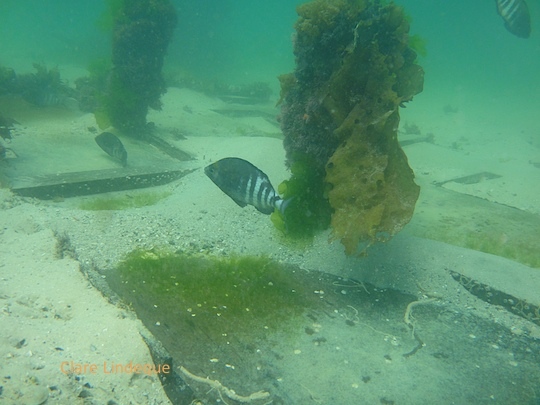 In the picture below you can see how each male steentjie has his own little cleared patch of solid ground – here, they found some old wooden boards under the sand, but rocks also do quite well. 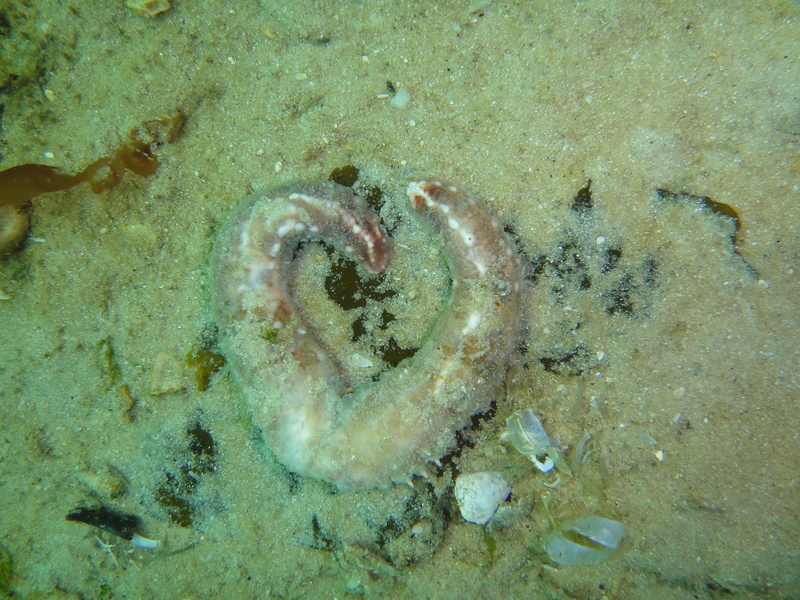 The females that are deemed attractive enough are encouraged to lay their eggs in a thin layer all over the hard surfaces guarded by the males, who then stay with the eggs for a few days (I think it was about a week for these guys pictured) before apparently losing interest and going about their everyday business elsewhere. The eggs rapidly become covered with sand after the males leave, which I suppose provides the protection that they are now lacking from their male parents. 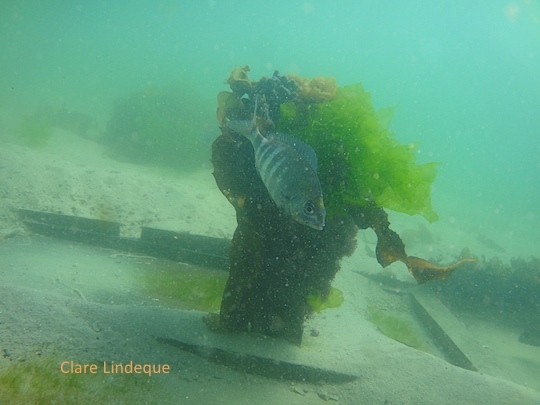 Even when the males are out of their breeding colours and just ordinary silver fish, they are striking – in Tony’s video you can see that they have an interesting little yellow and blue stripe across their noses. 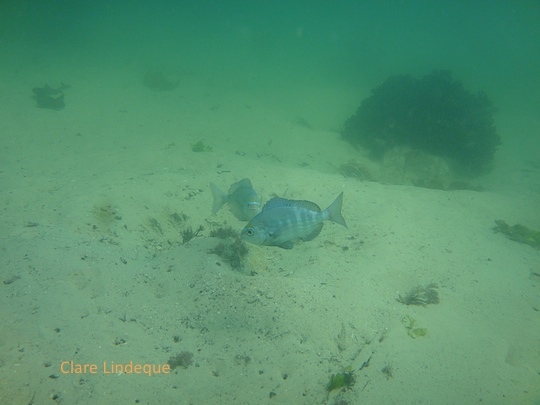 Steentjies are ordinary-looking silver fish with fascinating courtship rituals. Around breeding time the males body colouring changes to black stripes and their heads turn solid black, and they find an area of sand with something hard underneath. They use their tails to clear away the sand until they find bare rock or (in this video) an old piece of wooden board. These holes can be quite deep and very wide. The male stays at his cleared away area and is visited by several females. He does not accept all of them. If he likes a female, a little courtship interaction takes place (watch how she changes colour on the top half of her body). 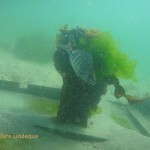 When the eggs are finally laid on the rock or board (not shown here), the male fish guards them for some time, chasing away any creature (including divers) that comes too close. The last ee cummings we enjoyed was on my birthday. 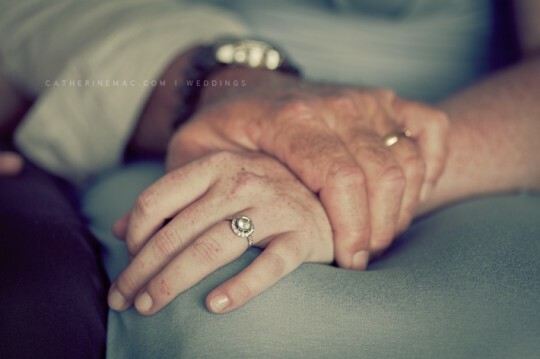 Here’s something beautiful and inspirational for the week of Tony’s and my first wedding anniversary – enjoy! It’s from the same anthology as the first one: 95 Poems. The growth of group buying websites in South Africa has been on the increase of late and I think the almost worldwide squeeze on disposable income has contributed to their success. The concept is easy to understand. The website operators arrange a huge discount from a supplier, add a commission for themselves and then promote your product or service. For some of these sites the number of views per deal offered is staggering. The deal goes live on their website for seven days with a minimum number of purchases required to make the deal work. If not enough people buy, the deal falls away. Dealio is a relative newcomer to the arena and was therefore my choice for running a diving promotion. The bigger the company the harder they squeeze you for a big discount and the greater the commission the make. 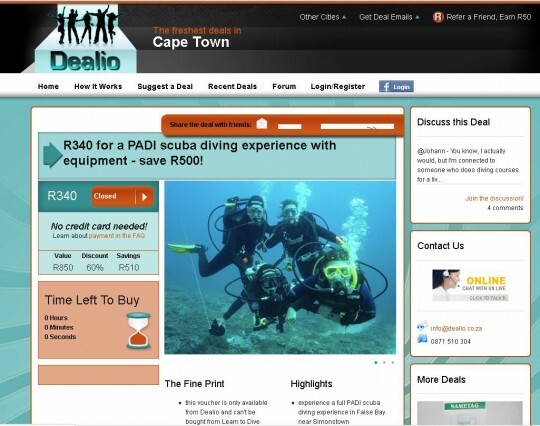 Whilst our promotion was on the front page of Dealio they had a radio advert where the deal, and therefore Learn to Dive Today, was mentioned on radio. We track the number of visits to our website and on the day the deal was opened we had a jump to ten times the daily average for the month. 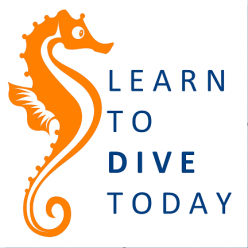 In total 29 people bought a Discover Scuba Diving experience and I was extremely happy with that number, not to mention the radio air time, web advertising and traffic to our website. To top it all, the first to people to arrive for their diving experience had decided on an underwater proposal so this made it a very special occasion. 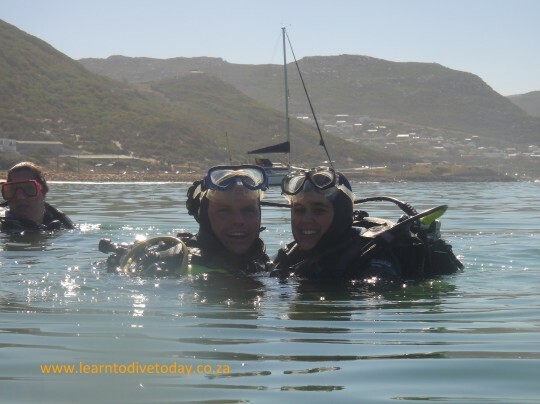 We had a request from a Discover Scuba candidate called Jacques, for assistance in proposing to his girlfriend, Kalika. He wanted to do this during the dive. Being Discover Scuba candidates and not qualified divers meant we had to ensure they were comfortable in the water and enjoying the dive before we could attempt this. I also had to be really close, as that is the standard with first time divers, yet far enough away in case she said no and took a swing at him. Well, none of this happened! 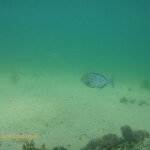 They were comfortable and enjoying their dive when I stopped them, got them settled on the sand and handed him a slate to write on. I won’t give the details of the slate’s contents other than to say there was a “YES!”, a fair amount of clumsy hugging in dive gear and a huge plastic and silver dummy engagement ring. Jacques then punched the air… um, water with glee several times a minute for the rest of the dive and swam with great gusto in circles around the rest of us. Needless to say his air was up long before the rest of us but once on the surface the happiness and hugging continued. Back on the beach a little fox terrier appeared with a package strapped to his collar and in this package was the real ring. Clare had flowers ready and we handed them to Jacques whilst Kalika was distracted. Within minutes of exiting the water she had a (real!) ring and flowers in her hand and a humungous smile on her face. We also had a video camera (ably operated by the legendary Kate) and a still camera on the dive and were able to supply the couple with a short movie (above) and many photos of the event from start to finish. Congratulations Jacques and Kalika! We wish you a lifetime of happiness together! Here’s the parking area at Windmill, courtesy of Google maps. Make sure you get a car guard if you go diving here. To get to the beach, walk down through the low gate and follow the path as it curves to the left. This is a popular picnic and wedding spot, too. Our wonderful wedding photographer, Catherine Mac, has almost finished the final work on our wedding pictures. She’s put some up on her blog, here. If you want to know what we look like out of our wetsuits, now’s your chance. Catherine is a genius – she took two of the most reluctant photographic subjects on earth, and made us look presentable! Our wedding starfish at Long Beach… see, he is lying in a heart shape!